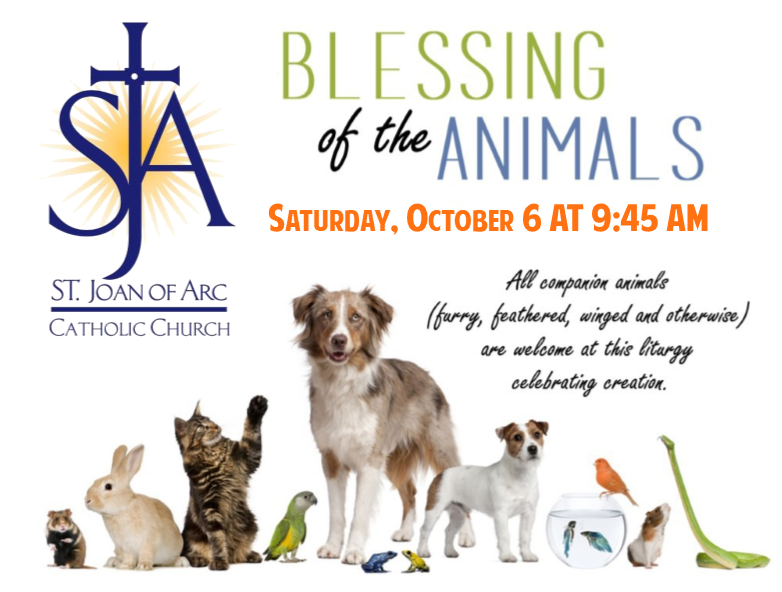 Blessing of the Animals will take place on Saturday, October 6th, at 9:45 AM in front of the Parish Center. All companion animals (furry, feathered, winged and otherwise) are welcome at this liturgy celebrating creation. Please remember to bring water and clean-up bags for your pet. There will be a collection for the Dauphin County Humane Society. Some of the suggested items on their "wish list" are: Canned Pet food, Sensitive stomach cat food, Peanut Butter, Non-clumping cat litter, Sheets, towels, comforters, etc. (old/used linens are fine) Ziploc Sandwich bags Paper towels Laundry detergent Bleach (unscented) Garbage bags Hand soap Windex Clorox wipes. Thank you for your participation. We look forward to seeing our many Parish pets and their owners! *In case of inclement weather, the blessing will be held across the street from the church under the covered walkway leading to the entrance of the school.